Messier 31, also known as the Andromeda galaxy is a large spiral galaxy and is home to about 1 trillion stars. It is about 250,000 light years in diameter and is also the largest galaxy in our local galaxy group which consists of the Triangulum galaxy, Milky Way galaxy, and 44 other galaxies. Some recent studies suggest that our Milky Way galaxy may actually be denser than the Andromeda galaxy even though our galaxy is much smaller. The Hubbell Space Telescope discovered what appear to be two galactic cores. One thought is that there are actually two galactic cores perhaps caused by an earlier interaction between two galaxies. The other thought is that there is only one core but it appears as two cores due to dark dust clouds partially obscuring the view. The Andromeda galaxy contains globular and open star clusters, Ha nebula regions, planetary nebula, super nova, and other objects found in spiral galaxies. M31 contains the largest observed globular cluster known as G1. This cluster contains several million stars and is twice as luminous as Omega Centauri (the largest and brightest globular in our galaxy). To date, there have been about 460 globular clusters discovered in M31. The globular clusters in M31 range in age from several million years to about 5 billion years while the ones in our galaxy typically are over 10 billion years old. There is also a very large star cloud that has its own NGC designation, NGC 206, and is visible in my image in the top left corner of the galaxy arm. As with most spiral galaxies there are several Ha regions contained within the spiral arms. These areas are where star formation is actively occurring and many in M31 can be seen with amateur telescopes and CCD cameras. A recent paper [Univ. of Western Ontario Aug 2011] states 3,691 Ha regions have been discovered in this galaxy. To the bottom left of the galaxy is Messier 110. This is a small elliptical galaxy and from Earth is about the same distance as M31, 2.9 million light years. At magnitude 8.5 it is to dim to see with the naked eye. This galaxy is also a satellite galaxy of M31 which means it is gravitationally bound with M31. There have been 8 globular clusters found in this galaxy and there are also a few dust lanes apparent in images captured with larger telescopes. Directly above the core of M31 is Messier 32. This is a small elliptical galaxy and it is also gravitationally bound with M31. 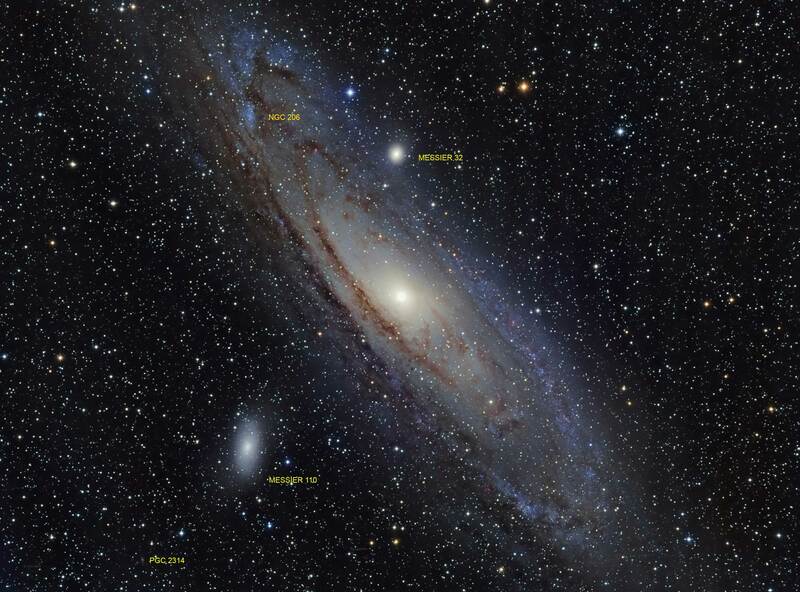 Its distance from Earth is about the same as M31 and M110 at 2.9 million light years. At magnitude 8.1 it can’t be observed with the naked eye. As with most elliptical galaxies M32 is old and there are not a lot of Ha regions where new star formation is occurring.